6/2/11 – Acquisition – Clermont-Ferrand, Musée d’art Roger-Quilliot – A student of David, who failed the Prix de Rome contest several times, Thomas Degeorge’s career was nevertheless an honourable one specializing in historical painting, genre scenes and portraits first in Paris, then in Clermont-Ferrand, his home town, where he settled permanently after 1838. The Musée Bargoin in Clermont-Ferrand staged an exhibition on his work from October 1978 to January 1979, presenting essentially the bequest left by his wife as well as his workshop holdings, that is, around sixty paintings and two sketchbooks. 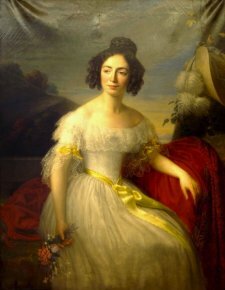 Generally average in quality when doing historical paintings, Degeorge however produced very attractive feminine portraits. One of these (ill. 1) has just been acquired by the Musée d’art Roger –Quilliot which has presented the city’s Fine Arts collections since it opened in 1992. The portrait was purchased at auction from the auctioneers Vassy-Jalenques in Clermont-Ferrand for 12.000 €  on 29 January 2011. This canvas, discovered in 2004 by Jean-François Luneau, a specialist of the artist, represents Louise-Marie de Laval who married the Baron Anne-Marie-Mathias Camille Delaval in 1818 (thus her maiden name remained practically unchanged). It is signed and dated 1838, that is, the year he returned to Clermont-Ferrand. 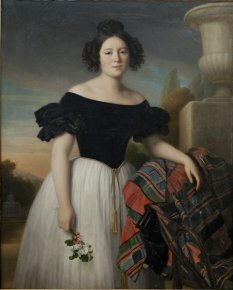 The painting can be compared to the Portrait of Madame Degeorge already held at the Musée d’art Roger-Quilliot (ill. 2), executed at exactly the same period and of about the same size. There is no question that both paintings are among the artist’s masterpieces. We point out that in 2013 there will be another retrospective on Degeorge in Clermont-Ferrand.